The Procession is on Saturday, Sept. 10th. THURSDAY 9/8 "New Jersey American Idol Nite"
SATURDAY 9/10 "OUR FEAST DAY"
The Macy's Fourth of July Fireworks celebration as seen from Weehawken, NJ. A dazzling display of July 4th fireworks over the Hudson River thrilled hundreds of thousands of spectators who endured 100-degree heat to witness the patriotic pyrotechnics. "It was really amazing," gushed 10-year-old Maddie Whittemore, from Lakewood Ranch, Fla.
"I've never seen a fireworks show this long. This is my first time in New York, and I had a great experience." Guy Fleury, 53, from Brooklyn, who came with his wife and two kids, was equally awed by the annual Macy's show. "It's an amazing feeling to be here. You're so close, you feel it right here," he said, pointing to his heart. "This is the best fireworks I've seen so far." Ray Monk, 45, from Collinswood, NJ, said, "It was beautiful. I turned down Philadelphia fireworks to see this, and it was the right choice." The crowd began gathering early to score the best spots. "We got here at 1:30," Elias Martoral said at his waterfront perch on Pier 84. "We bring our own food, because it's way too expensive here," he added, referring to the $3 waters and $4 fountain sodas. At least he didn't pay for his primo location. Some folks bent on the best views forked over enough loot to make even the $7 slushies look like a bargain. Hudson Terrace, a rooftop bar near the river, sold 250 tickets at prices from $150 to $1,450 -- all for the 1,000-foot-high display of fiery plumes that Macy's was providing for free. There were plenty of takers. "The fireworks were definitely a huge draw for us," said Erika London, an event planner at the bar. Mayor Bloomberg, who attended the fireworks, was earlier at the 100th annual Travis Fourth of July Parade on Staten Island, where he said, "This is the most wonderful country in the world." If you're planning to catch the Macy's Fourth of July Fireworks from the New Jersey waterfront don't go to Jersey City. Through e-mails and signs, the city's Police Department is warning residents and people across the region that the Jersey City waterfront is not the place to view the Macy's fireworks display. "We don't want disgruntled people because they can't see it," Jersey City Police Lt. Edgar Martinez said. "North Hudson is a better view." Hoboken Mayor Dawn Zimmer is on vacation, but her spokesman Juan Melli said the city doesn't mind Jersey City sending spectators their way. "It's not an issue," he said. "We welcome them with open arms." This is the second year in a row Macy's is hosting its display on the Hudson River, and Jersey City's waterfront was packed last year - but for another fireworks show, the city's own. Earlier this month, Jersey City Mayor Jerramiah T. Healy canceled the city's July 4 fireworks display and re-routed the money to other summer events. With the Macy's fireworks being held between 24th and 50th streets in New York, the best views will be in Weehawken and the northern part of Hoboken, Martinez said. The Jersey City Police Department used Nixel, an automated system that sends e-mails and text messages to subscribers, to alert residents that there will not be festivities along the waterfront or at Liberty State Park. "Unfortunately, we do not expect the Downtown and waterfront areas of Jersey City to have ideal viewing of the celebration," the message states. While Liberty State Park will be open until 10 p.m., state officials also warn it won't be the place to catch Sunday's fireworks. "Visibility may be possible, but extremely limited," said Larry Ragonese, a spokesman for the state Department of Environmental Protection. Despite the warnings, Newport on Jersey City's waterfront is marketing itself as a great place to dine, shop and view the display. As The Journal’s Melanie Grayce West reported last month, budget problems have caused some area cities–among them Stamford, Conn. and Jersey City–to cancel their Independence day fireworks displays. But there will still be plenty of sparkling lightsacross the greater New York area this weekend. In the city on Sunday, the Macy’s fireworks show will again be on the Hudson River, providing those on New York’s West Side and in parts of New Jersey with the best views. North Brooklyn parks like East River State Park, Grand Ferry Park and the lesser-known Transmitter Park in Greenpoint offer the clearest views of the fireworks. Financial district skyscrapers partially obscure the view from Brooklyn Heights Promenade and the new Brooklyn Bridge Park, but southern Brooklynites can flock to the 69th Street Pier in Gravesend for a straight peep up the river. For those viewing the fireworks elsewhere, here’s a list of displays across the greater New York area this weekend. All begin approximately at dusk, or about 9 p.m.
- Coney Island boardwalk in Brooklyn, NY. - Coopers Beach in Southampton, NY. - Westfield Trumbull Mall in Westfield Trumbull, Conn.
- West Wharf Beach in Madison Center, Conn.
- Playland Amusement Park in Rye, NY. - Wolfe’s Pond Park in Staten Island, NY. - Devon Yacht Club in Amagansett, NY. - Havens Beach in Sag Harbor, NY. – Eisenhower Park in East Meadow, NY. - Bradley Point in West Haven, Conn.
- Westfield Connecticut Post Mall in Milford, Conn.
- Kensico Dam Plaza in Valhalla, NY. - Binney Park in Greenwich, Conn.
- Along Route 25A in Wading River, NY. - Umbrella Beach in Montauk, NY. - Westhampton Country Club in Westhampton Beach, NY. - Brookhaven Amphitheater Arts & Cultural Center in Farmingville, NY. - Davis Park in Fire Island, NY. - East Rock Park in New Haven, Conn.
- Stanley Quarter Park New Britain, Conn.
- Five Islands Park in New Rochelle, NY. - Harbor Island in Mamaroneck, NY. - Caramoor in Katonah, NY. - Memorial Park in Maplewood, NJ. - Memorial Oval in Livingston, NJ. - Yogi Berra Stadium in Little Falls, NJ. - Memorial Park in Bloomfield, NJ. - Grangebel Park in Riverhead, NY. Fireworks brighten the sky while entertaining thousands at Macy's annual Fourth of July extravaganza over the East River in this file photo. Get out your stars and stripes. It's Fourth of July weekend and Brooklyn is having patriotic parties - with festivals, fireworks, barbecues and more - all over the borough. Kick off the holiday weekend tonight by taking in a free fireworks display at Coney Island. The pretty pyrotechnics will start at 9:30 p.m. and can be seen anywhere on the Boardwalk from W.Fifth to W. 21st Sts. The 39th Annual International African Arts Festival kicks off tonight and continues through Monday from noon to 9p.m. each day at Commodore Barry Park, Park Ave. and Navy St. There will be live music and performances, workshops; an African marketplace, plus an arts and crafts zone, storytelling, clowns and a youth talent search for kids. Call (718) 638-6700 or visit iaafestival.org. for details. Macy's has moved its annual July 4 fireworks display from the East River to the Hudson River for the second straight year, but if you don't want to leave the borough on Sunday at 9:20 p.m. you can catch part of the action from waterfront parks in Greenpoint andWilliamsburg, like East River State Park (90 Kent Ave.), Transmitter Park (end of Greenpoint Ave.), and Grand Ferry Park (Grand St. and River St.). You can also get a glimpse from the 69th St. pier in Bay Ridge. On Saturday and Sunday, stand tall and declare your independence at the Lefferts Historic House, entrance near Flatbush Ave., Ocean Ave. and Empire Blvd. Kids can craft their very own plumed hat to wear while signing a reproduction of the Declaration of Independence with a genuine quill pen from 1 p.m. to 4p.m. both days. The eagle as an icon of American patriotism will be celebrated at the Prospect Park Audubon Center, just inside the Lincoln Road and Ocean Ave. entrance. Kids can learn about the eagle's role in our nation's identity and create eagle-themed crafts from noon to 5 p.m. Saturday and Sunday. Call (718) 965-8999 or visit prospectpark.org for more info. What's the Fourth of July without Nathan's Famous Hot Dog Eating Contest? For 94 years, people from all over the country have been flocking to Coney Island to watch competitors eat as many franks as they can. The contest starts at noon Sunday at the at Surf and Stillwell Aves. Let's see if reigning champ Joey Chestnut can keep his "Mustard Yellow Belt." ANNUAL ALL-NIGHT WALKING TOUR OF REVOLUTIONARY WAR NEW YORK, Lower Manhattan. Led by James Kaplan. It meets Sunday at 2 a.m. at Broadway and Murray Street and ends at 6 a.m. in front of Fraunces Tavern Museum, 54 Pearl Street, the sponsor of the walk. Fee: $20, members $15; (212) 471-8546 or (212) 425-1778. EATING CONTESTS Sunday at noon, the annual Nathan’s Famous Fourth of July International Hot Dog Eating Contest, Surf and Stillwell Avenues, Coney Island, Brooklyn, with entertainment beginning at 10 a.m.; ifoce.com. A hot dog bun-eating contest among three elephants and four human contestants takes place Friday at 11:30 a.m. at Surf Avenue and 21st Street. Saturday at 1 p.m., the annual Little Italy Pasta Eating Competition, in front of S.P.Q.R. restaurant, 133 Mulberry Street; (212) 302-0551. EMANCIPATION DAY CELEBRATION, Weeksville Garden, 1698 Bergen Street, Brooklyn. Free events on Saturday to commemorate the end of slavery in New York State in July of 1827, featuring a lecture at 4 p.m., a performance by the musician Cody Chestnutt at 6 p.m. and a film screening at 8 p.m.; participants should provide their own seating. Presented by the Weeksville Heritage Center; (718) 756-5250;weeksvillesociety.org. FREE CONCERT IN VAN CORTLANDT PARK, Rockwood Drive Circle, Broadway and Mosholu Avenue, Riverdale, the Bronx. Sunday at 2 p.m., featuring patriotic music and jazz performed by the Bronx Arts Ensemble Jazz and Dixieland Band; rain location, Vladeck Hall, Amalgamated Houses, Hillman Avenue and Van Cortlandt Park South; (718) 601-7399; bronxartsensemble.org; spectators should provide their own seating. GREAT FOURTH OF JULY FESTIVAL, on Water Street, between Fulton and Broad Streets, Lower Manhattan. Sunday, 10 a.m. to 6 p.m. HISTORIC FORT GREENE PARK, Brooklyn. Tours of the Revolutionary War roots of the park and neighborhood: Saturday at 11 a.m., led by the Urban Park Rangers, meeting at the Fort Greene Park Visitors Center, reachable from Myrtle Avenue and Washington Park; free; 311; nyc.gov/parks/rangers. Sunday at 2 p.m., Metro Tour Service will meet in front of the New York Marriott, at Adams and Tillary Streets, downtown Brooklyn; $25; reservations required: (718) 789-0430. INDEPENDENCE DAY EVENTS AT CONFERENCE HOUSE, Hylan Boulevard and Craig Avenue, Tottenville, Staten Island. Saturday events: from 1 to 3 p.m., tours of the historic house; $3, $2 for children; at 2 p.m., a free reading of the Declaration of Independence in the park, sponsored by Staten Island OutLOUD (spectators should provide their own seating); at 4 p.m., a free performance of patriotic songs and other music by the Staten Island Philharmonic and choir in the pavilion; (718) 984-6046;conferencehouse.org. JAZZ AT THE LOUIS ARMSTRONG HOUSE MUSEUM, 34-56 107th Street, Corona, Queens. A free outdoor performance on Sunday at 1 p.m. by the British musician Gwyn Jay Allen and his band; also house tours from noon to 4 p.m.; (718) 478-8274;louisarmstronghouse.org; tour tickets, $8, $6 for students and 65+, free for members and children under 4. MERETZ/ISRAELI CIVIL RIGHTS STREET FAIR, Lexington Avenue, between 34th and 42nd Streets. Sunday, 11 a.m. to 6 p.m.
MCBURNEY YMCA STREET FAIR, Avenue of the Americas, between 14th and 23rd Streets. Saturday, 11 a.m. to 6 p.m. REVOLUTIONARY WAR WALKING TOURS IN LOWER MANHATTAN Patriot Tours: Saturday and Sunday at 1 p.m.; $23; meeting place and reservations: (917) 716-4909 or (212) 209-3370; patriottoursnyc.com. Gotham Walk: Saturday through Monday at 11 a.m. and 1:30 p.m., meeting in front of 222 Broadway, near Vesey Street; $10 ($7 for an additional person); (212) 629-1886. Big Onion Walking Tours: Sunday at 2 p.m., meeting at the intersection of Broadway and Murray Street; $15; $12 for 63+ and students; (212) 439-1090; bigonion.com. MACY’S FOURTH OF JULY FIREWORKS: ‘AMERICAN HARMONY’ over the Hudson River on Sunday beginning about 9:20 p.m. Best viewing in Manhattan: along the West Side Highway, northbound lanes, and 12th Avenue, between 23rd and 59th Streets; some side streets between 11th and 12th Avenues; and Piers 54 (from 14th Street) and 84 (from 44th Street); DeWitt Clinton Park, on 52nd to 54th Streets between 11th and 12th Avenues will be open to viewers with disabilities. Waterfront locations in New Jersey with unobstructed views over the Hudson — among them Hoboken, Weehawken and North Bergen — can also offer good viewing sites. The fireworks show will be broadcast on WNBC, Channel 4, beginning at 9, with a recorded score featuring the New York Pops and the Mormon Tabernacle Choir. The singers Justin Bieber, Enrique Iglesias, LeAnn Rimes and cast members from the Twilight Saga film series will be part of the live broadcast; Nick Cannon, the actor and comedian, and the actress Alison Sweeney will host. WINS radio, 1010 AM, will offer simultaneous broadcast. (212) 494-4495. For those viewing from boats: (212) 494-5243. Other viewing locations with admission: the Intrepid Sea, Air and Space Museum, Pier 86, 46th Street and 12th Avenue, $100 per person,intrepidmuseum.org. ; New York Waterway Tours boats, $75, $65 for children under 12, (800) 533-3779, nywaterway.com; the Circle Line 4th of July Cruise and Pier Party, also sponsored by World Yacht on Piers 81 and 83, each $79, (212) 563-3200, circleline.com. REVOLUTIONARY NEW YORK SCAVENGER HUNT, Lower Manhattan. Saturday, 1 to 3:30 p.m., led by Watson Adventures; $24.50 in advance; reservations and meeting place: (877) 946-4868; watsonadventures.com. USO — AVENUE OF THE AMERICAS SUMMERFEST, between 42nd and 56th Streets. Saturday, 11 a.m. to 6 p.m.
CARAMOOR INTERNATIONAL MUSIC FESTIVAL, International Music Festival, 149 Girdle Ridge Road, Katonah. Saturday beginning at 4 p.m., “American Roots: New Shoots,” a program of bluegrass and traditional music with the Punch Brothers, Crooked Still and others; $15 to $55. Sunday at 8 p.m., “Pops, Patriots and Fireworks,” with a performance by the Orchestra of St. Luke’s, followed by fireworks; $30 to $70 (half-price for children under 12); picknicking encouraged. (914) 232-1252; caramoor.org. FOURTH OF JULY GREAT AMERICAN CELEBRATION, Dutchess County Fairgrounds, Route 9, Rhinebeck. Friday at 5 and 8 p.m., two rodeos. Saturday at 3:30 and 7:30 p.m., two demolition derbies. Sunday, at 8 p.m., a concert by the Hudson Valley Philharmonic. Fireworks are scheduled each day at dusk. There will also be children’s rides, a petting zoo and refreshments on all three days. Tickets to Friday and Saturday events are $10, $8 in advance. Tickets to the Sunday concert are $12, $8 in advance or $45 per carload, $35 in advance. (845) 876-4000; dutchessfair.com. INDEPENDENCE DAY CELEBRATIONS AT HISTORIC HUDSON VALLEY, Sunday, 10 a.m. to 6 p.m., with music, dancing and a 19th-century baseball game at Sunnyside, 89 West Sunnyside Lane, Tarrytown, (914) 591-8763; and a parade, military re-enactments and a reading of the Declaration of Independence at Van Cortlandt Manor, 525 South Riverside Avenue, Croton-on-Hudson, (914) 271-8981. Admission to each celebration is $12; $10 for 62+; $6 for 5 to 17; free for children under 5 and members; grounds admission only is $5, $3 for children 5 to 17 and free for members.hudsonvalley.org. INDEPENDENCE DAY CELEBRATION, John Jay Homestead State Historic Site, 400 Route 22, Katonah. An outdoor performance by the American Colonials Fife and Drum Band and a reading of the Declaration of Independence, and tours of the house following the presentation. Sunday, beginning at 1 p.m.; (914) 232-5651;johnjayhomestead.org; the outdoor event is free, and spectators should provide their own seating; tours, $5, free for children 12 and younger. INDEPENDENCE DAY CELEBRATION, St. Paul’s Church National Historic Site, 897 South Columbus Avenue, Mount Vernon. Sunday at 10:30 a.m., with music, speeches and tolling of the bell and a reading of the Declaration of Independence. (914) 667-4116;nps.gov/sapa. Free. MUSIC FESTIVAL AND FIREWORKS, Kensico Dam Plaza, Bronx River Parkway, Valhalla. With picnicking and music by the Wanderers and the Gerard Carelli Orchestra. 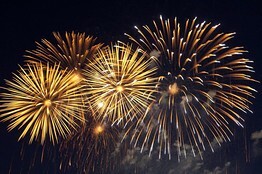 Saturday; gates open at 5 p.m.; music begins at 6 p.m.; fireworks start at 9:15 p.m.; (914) 864-7275; westchestergov.com. OLD-FASHIONED FOURTH OF JULY, Muscoot Farm, Route 100, Somers. Sunday, 1 to 3 p.m., with picnicking, games and hand-churned ice cream. (914) 864-7282;muscootfarm.org. Free. RIDES AND FIREWORKS AT PLAYLAND PARK, Exit 19 off Interstate 95, Rye. This weekend the park will be open for rides and entertainment Friday and Saturday, 1 p.m. t0 midnight; Sunday, 11 a.m. to midnight; and Monday, 1 to 10:30 p.m. Fireworks will go off on Friday, Sunday and Monday at 9:15 p.m. (914) 813-7010; ryeplayland.org. All-inclusive daily ride admission: $30 ($25 for Westchester residents). Admission only, $5 ($3 for residents); parking, $5 ($7 Saturday and Sunday, $10 on Monday). UNITED STATES MILITARY ACADEMY CONCERT BAND, at West Point, Trophy Point Amphitheater, Route 9W North to Highland Falls. Saturday night at 8 (rain date, Sunday), a performance by the Hellcats, Jazz Knights and Concert Band; (845) 938-2617;www.usma.edu/band. Free, but concertgoers should call on the day to confirm; photo ID is required. COMEDY, MUSIC AND FIREWORKS IN MONTAUK Saturday at 8:30 p.m., the Fifth Annual Long Island Comedy Festival at Montauk Downs, 50 South Fairview Avenue; $25; (631) 668-2089. Sunday at 9 p.m., “Stars Over Montauk,” with fireworks by Grucci, at Umbrella Beach; rain date is Monday; (631) 668-2428. Monday at 6:30 p.m., free acoustic rock music on the Green by the musician Chiron Red. Information for fireworks and music: (631) 668-2428; montaukchamber.com. 1865 INDEPENDENCE DAY CELEBRATION, Old Bethpage Village Restoration, 1303 Round Swamp Road, Old Bethpage. Sunday, 11 a.m. to 4 p.m., with a parade, performances by a brass band and children’s games. (516) 572-8400;www.nassaucountyny.gov ; $10; $7 for children 5 to 12, volunteer firefighters and 60+; free for under 5. EISENHOWER PARK, Hempstead Turnpike, East Meadow, the Big Apple Circus production “Bello Is Back!,” Friday at noon and 6:30 p.m., Saturday and Sunday at noon; $15 to $45; (800) 922-2772; bigapplecircus.org. Saturday, “Celebrate America,” a presentation at the Harry Chapin Lakeside Theater (near parking fields 6 and 6A), with music by the Beach Bummz, a Beach Boys tribute band, beginning at 7:30 p.m. and a fireworks display at 9:30 p.m. Tickets, which are free, are required for entry to the theater, but other viewing areas will be open; all spectators should provide their own seating; ticket and other information: (516) 572-0223; www.nassaucountyny.gov/parks.INDEPENDENCE DAY AT SAGAMORE HILL, 12 Sagamore Hill Road, Oyster Bay. Sunday and Monday, 10 a.m. to 4 p.m., with free events that include a Theodore Rooseveltre-enactor, music, storytelling and animal demonstrations; food is additional; the first floor of the historic house is open for free viewing on Sunday, but tours on Monday are $5 and free for children 15 and younger; (516) 922-4788; nps.gov/sahi. NASSAU COLISEUM FAIR, off the Meadowbrook State Parkway, Uniondale. With rides, a magic show, a petting zoo and fireworks (on Saturday). Friday, 5 to 11 p.m.; Saturday and Sunday, 3 to 11 p.m. (631) 920-0910; nassaufair.com. Admission $8 (or $4 with online coupon), free for those 2 and younger. MUSIC AT THE WESTHAMPTON BEACH PERFORMING ARTS CENTER, 76 Main Street, Westhampton Beach. Saturday at 8:30 p.m., the soul group the Stylistics; $65, $80 and $95. Sunday at 10 p.m., the drummer Dan Bailey and his group Living Rhythm; $20; (631) 288-1500; whbpac.org. VALLEY STREAM FIREWORKS AND MUSIC, Firemen’s Memorial Field, East Fenimore Street and Albermarle Avenue. Sunday, with entertainment beginning at 8 p.m., followed by the fireworks at 9:15 p.m.; rain date, Monday. $5, free for children under 2; (516) 825-4200; valleystreamvillage.org. P. T. BARNUM’S 200TH BIRTHDAY BASH, Barnum Museum, 820 Main Street, Bridgeport. Monday, noon to 3 p.m., with indoor and outdoor activities including concerts, crafts workshops, a stage show, an animal exhibit and museum tours; some sections of the museum will be closed because of damage from a recent storm; $5, $4 for students and 65+; $3 for children 4 to 17 years old; free for those under 4. (203) 331-1104;barnum-museum.org. EAST LYME FOOD, CRAFTS AND COLLECTIBLES, East Lyme Town Hall, Pennsylvania Avenue, East Lyme. Saturday, 10 a.m. to 6 p.m. and Sunday, 10 a.m. to 5 p.m., the Annual Lobsterfest and Chicken BBQ and the Niantic Outdoor Arts and Crafts Show; admission to the show is free; chicken, $9; lobster, market price; (860) 739-9128 or (860) 739-2805; nianticlions.org. FIREWORKS DISPLAYS In Hamden on Friday, at the Town Center Park, 2761 Dixwell Avenue, with music by the United States Air Force Band of Liberty at 7:30 p.m., followed by fireworks at 9:20 p.m.; hamdenartscommission.org. In New Britain on Sunday, in Stanley Quarter Park, 2159 Stanley Street, with music and games at 5 p.m. and fireworks at 9:15 p.m.; $5; (860) 826-3360; new-britain.net. At the Quassy Amusement Park, Route 64, Middlebury, a 3-D fireworks display at dusk; viewing glasses, $1; parking, $7; (203) 758-2913; quassy.com. FREE MUSIC AT LEVITT PAVILION FOR THE PERFORMING ARTS, 40 Jesup Road, Westport. Saturday at 8 p.m., Aztec Two-Step. Sunday at 7 p.m., Jay Geils and Gerry Beaudoin and the Kings of String; (203) 221-2153; levittpavilion.com. MUSIC AND FIREWORKS AT THE WESTFIELD TRUMBULL, 5065 Main Street, parking lot, Trumbull. Friday, 6 to 10 p.m., with music by the group Nine Days, a carnival and fireworks; $1, to benefit the Trumbull ACE Foundation and the Trumbull Youth Association. Rain date, Monday; (203) 372-4500; westfield.com/trumbull. MYSTIC SEAPORT, 75 Greenmanville Avenue, Exit 90, off Interstate 95, Mystic. Sunday, 9 a.m. to 5 p.m., an Independence Day Celebration, with food, music, games, a children’s parade and ice-cream churning; $24; $22 for students, 65+ and active military personnel; $15 for those 6 to 17; free for 5 and younger; food is additional. Sunday, 5 to 8 p.m., the first of a summerlong series Sunday Evenings by the River, with music and refreshments; free admission, with cash bar; (860) 572-5315 or (888) 973-2767;mysticseaport.org. TALCOTT MOUNTAIN MUSIC FESTIVAL, Iron Horse Boulevard, Simsbury. Friday at 7:30 p.m., “Celebrate America!,” a performance of show music, marches and patriotic songs by the Hartford Symphony Orchestra, with fireworks; $20 in advance, $25 at the door, $5 for children 12 and younger; (860) 244-2999; hartfordsymphony.org. FIREWORKS DISPLAYS In Red Bank, in Marine Park, Wharf Avenue and Riverside Gardens Park, on Saturday, with entertainment beginning at 4 p.m. and fireworks displays at dusk and 9:15 p.m. In Maplewood, Sunday at 9 p.m. in Ricalton Square. In Asbury Park, Sunday at dusk on the boardwalk. In Bradley Beach, Sunday at 9 p.m. on the boardwalk. In Florham Park, on Ridgedale Avenue, Monday at 9 p.m.
BRIDGEWATER INDEPENDENCE DAY FAMILY FESTIVAL, North Branch Park, 355 Milltown Road, Bridgewater. Sunday, 5 to 11 p.m., a magic show and fireworks; (908) 722-1200, Ext. 7; free. INDEPENDENCE DAY CELEBRATION AT HISTORIC COLD SPRING VILLAGE, 720 Route 9 South, Cape May. Saturday and Sunday, 10 a.m. to 4:30 p.m. with a vintage baseball game (Saturday at noon) and activities; $8, $7 for 62+, $6 for children 3 to 12, free for children under 3; (609) 898-2300; hcsv.org. OCEANFEST 2010, Long Branch. With entertainment, Sunday, 10 a.m. to 10 p.m., along the promenade, between Seven Presidents Park and the Ocean Place Resort and Spa; (732) 222-0400; longbranchchamber.org. PARADES In Rutherford, the Baby Parade begins Saturday at 10 a.m. at Lincoln Park, Lincoln and Park Avenues. In Ridgefield Park, the Baby and Youth Parade begins Monday at 9 a.m. at Poplar Street and Euclid Avenue, followed by the Civic Parade at 11:30 a.m. beginning at Preston Street and Hudson Avenue. In Glen Rock, the Fourth of July Parade begins at 9:30 a.m. at the high school, on Harristown Road. SUMMIT FOURTH OF JULY, Soldiers Memorial Field, 5 Myrtle Avenue, at Ashland Road, Summit. Monday, beginning at 9:45 a.m. with a flag-raising ceremony, followed by a children’s parade, games, entertainment, and a fireworks display at 9:15 p.m. (908) 277-2932; cityofsummit.org. WILDWOODS HOLIDAY EVENTS Sports Card, Toy, Comics and Collectibles Show, Friday through Sunday at the Wildwoods Convention Center, 4501 Boardwalk; (732) 422-9365; free admission. Boardwalk crafts show at Rio Grande Avenue, Saturday and Sunday, 9 a.m. to 5 p.m.; (609) 522-0378 or (609) 522-0198. Free concerts at 7:30 p.m. at Fern Road Park: Friday, the tribute band B Street Band; Saturday, the tribute band 2U; Sunday, the dance band Bandstand; (609) 523-0202. Parade on Sunday beginning at 9 a.m. at 15th and Atlantic Avenues. Fireworks on Sunday at 10 p.m. at the boardwalk at Pine Avenue; wildwoodsnj.com. Information on events for inclusion in Spare Times can be sent to weekend@nytimes.com. Looking for 4th of July activities in New York? True to our promise of keeping New York new for you, there’s something special in store for your summer in Times Square, the hot spot for bright lights and dazzling memories. Get a front-row seat to the festivities at our Manhattan Times Square hotel near 4th of July events. Be there to experience the dazzle of Macy’s New York Fourth of July Fireworks celebration, set to take place over the Hudson River for the second year in a row. 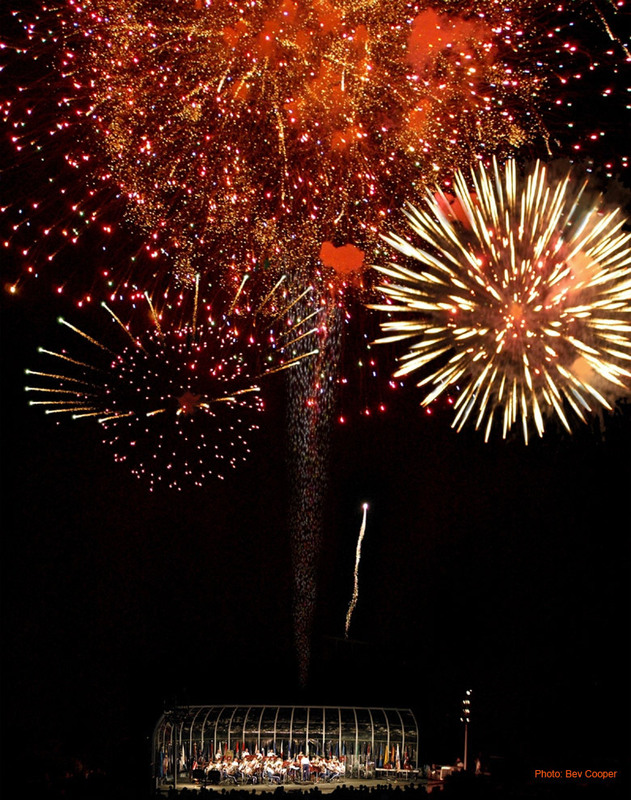 Make the most of this incredible event by reserving our spectacular 4th of July Fireworks Package! Reserve the ONLY guaranteed views in the hotel of the Macy’s 4th of July fireworks show over the Hudson River. *Valid 6/30/10 – 7/10/10. Stay must include the night of July 4th. Secure your supersonic seat for the nation’s celebration of independence with Crowne Plaza Times Square’s well-appointed Manhattan hotel rooms. Sorry Brooklyn, Queens and the Bronx. But West Side and New Jerseyresidents will once again have the best view of the Macy’s Fourth of July Fireworks . For the second year, the display will be held over the Hudson River instead of the East River. A mile-long pyrotechnic extravaganza will be set off from six anchored barges in the river starting at about 9:00 p.m Sundsy. Tune in to 1010 WINS to listen to a patriotic soundtrack during the show. It will also be broadcast live on WNBC 4 New York. Aside from packing a radio, bring plenty of water and icy treats to hydrate and cool off because Sunday promises to be a scorcher at 94 degrees. Since the fireworks launching pads will be stationed between 24th and 50th Streets, the city will be closing off the West Side Highway for spectators from 23rd to 59th Streets starting at 4:30 p.m. To get a good spot, it’s best to scope out a spot by 5 p.m.
Other prime viewing locations include Pier 54 at 13th Street, Pier 84 at 38th Street and the Hoboken waterfront. For a bird’s eye view of the Hudson River head to the Chandelier Room lounge in Hoboken’s W Hotel. Jersey City canceled its fireworks at Liberty Park and is turning spectators away spectators because it doesn't have it in its budget to handle crowds. However, several parks in Weehawken are good viewing options including, Waterfront Park, Hamilton Park and Louisa Park. 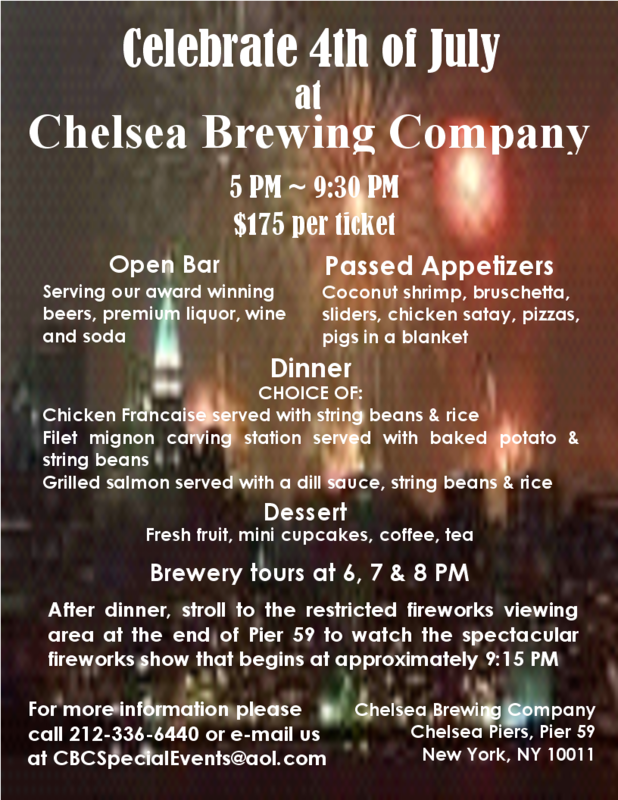 And if you’re willing to shell out some cash for a spot, viewing tickets are going for $125 at the Empire State Building, $170 for an open bar and sit-down dinner at the Chelsea Brewing Company, $150 for an open bar and all-you-can-eat barbecue at the Hudson Terrace, and $200 for a private party at Pier 66. Alternatively, hop on a NY Waterway cruise for $75 at 6 p.m. at the Fulton Ferry Landing in Brooklyn and watch the pyrotechnic show from the city’s glistening waterways. The Spirit of New Jersey will also be offering a five-course dinner cruise departing from Weehawken at 6 p.m.
From 9 to 10 p.m. music superstars Justin Bieber, Enrique Iglesias andLeAnn Rimes will perform onboard the Norwegian EPIC at the Macy’s fireworks display, which will be broadcast on WNBC Channel 4. Coney Island is in celebration mode every Friday from June 18 until Labor Day and has fireworks for your viewing pleasure starting at 9 p.m.